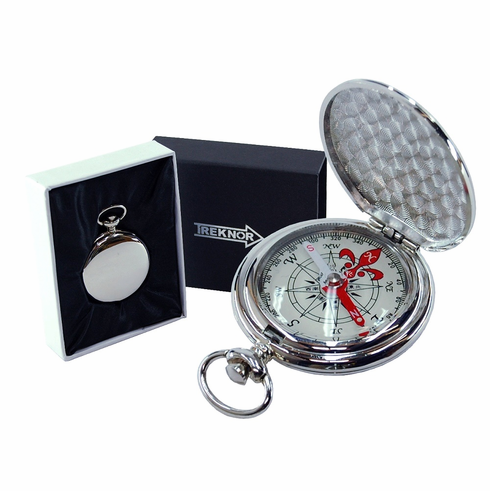 This stylish yet functional pocket compass from Treknor makes the perfect father’s day, graduation, birthday, or inspirational gift. Each outer side of the closed compass case features a smooth polished finish, acceptable for engraving. The interior of this pocket compass features a fluid filled capsule showcasing a traditional navigational print and a compass scale graduated in 2 degree graduations. The push-button top releases a spring loaded lid, making quick bearing readings a breeze. And each pocket compass comes packages in a nice black satin-lined gift box with the Treknor logo foil-printed in silver on the box exterior. Also available in Gold.